Add a bit of color to your home, porch or deck. 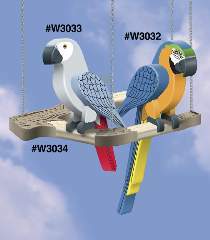 Make a Blue Macaw, an African Grey Parrot, and even a hanging branch for them to perch on. All plans are drawn FULL SIZE. Project plans for parrot, macaw, and branch are each sold separately. Order two yellow eyes for each bird, and screw eyes and chain for branch separately or see Special below.